It was in the summer of 2002 at Antigua Recreation Ground that a man with bandaged jaw was trying his best to break the ongoing West Indian partnership. He had been earlier hit on the jaw by a rising delivery from paceman Mervyn Dillon. And he got his victim...Carl Hooper...but alas! It was a no-ball. Still determined, despite doctor's advice to rest, this man continued to bowl...and there it came...the prized wicket of dangerous looking Brian Lara. Who can forget that splendid effort by Jumbo? Having bowled 14 overs with a fractured jaw, he ran a great risk. But such is his dedication to his team. And today, Anil Kumble became the first Indian bowler and the third in the world to reach the milestone of 600 wickets on day two of the third Test against Australia in Perth. 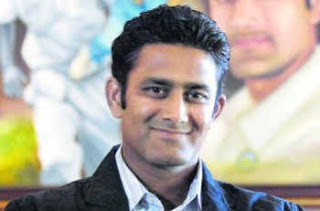 Kumble achieved the record just after the tea break when he had Andrew Symonds caught by Rahul Dravid at first slip. In India where the batsmen usually steal the limelight, this man has done a wonderful job in a glorious career spanning over 18 years. Congratulations to him for achieveing this unique feat. His fighting spirit was well drafted when he bowled 88.5 overs in a test match against Australia at Sydney Cricket Ground during 2003-04 tour and though the match ended in a draw, he returned triumphantly with 12 wicket haul in the match. He has won a number of awards and national honours ( Arjuna Award and Padam Shri). He already has a number of records to his credit(including 10 wicket haul in one inning) and at 37, though the age is not on his side, he still has a lot to offer. Way to go Jumbo!!! Sorry, dunno much abt cricket to comment! yes this man has a lot of courage nd will to succeed!!! he'll always come at u harder nd harder everytime,he has that never say die spirit in him.....a fighter in real sense!!!! nd one thing that is in my mind from quite sometime is that u nd kumble has many things in common(like ur humger for more success,toiling hard,lifting d spirits etc,nd also u look pretty much like him so cheers JUMBO alias! !